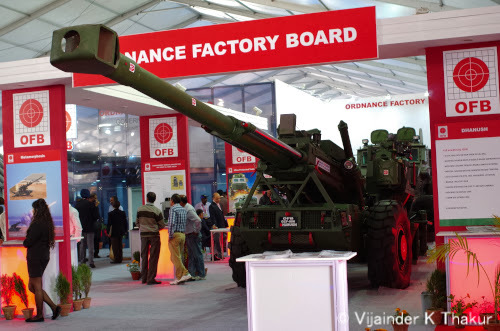 The Indian Express reported on July 6, 2015 that the Indian Army has granted OFB (Ordnance Factory Board) Bulk Production Clearance for 144 Dhanush guns. Gun Carriage Factory, Jabalpur has already started production of the gun; it plans to supply 6 guns within 6 months, another 12 within 12 months and another 36 guns within 24 months. Army had hoped to get all the 144 guns in 3 years! The MoD announced on April 27, 2015 that Dhanush has met all tech parameters in Winter and Summer Trials. The TOI reported on October 13, 2014 that field trials of the gun have been completed and OFB is currently waiting for the DGQA report on the trials. On July 6, 2015 the TOI reported that the recent Hawk AJT crash was attributed to quill shaft failure, leading to concerns about HAL production quality. A source reportedly told the TOI that Rolls-Royce has reduced the TBO (time between engine overhauls) of HAL produced Hawk AJTs from 2,000 hrs to 1,200 hrs, as a result of production quality concerns. HAL has denied the allegation. On June 3, 2015, an IAF Hawk crashed about 50 Km west of Kalaikunda airbase. Both pilots ejected safely. The crash was the second IAF Hawk crash. The first, was attributed to human error. On July 6, 2015 the Business Standard reported that the US is stonewalling India's request for cooperation on developing hot engine technology - specifically, India's desire to fund residual development of the F414 EPE as AMCA powerplant. As a result, MoD is issuing a global tender, inviting aero engine majors to co-develop with the DRDO an AMCA powerplant. The US stonewalling will bring back Eurojet EJ200 as contender for powering the AMCA. Eurojet reportedly convinced the DRDO it can uprate the EJ200 to 110 kN. One good reason for the US to stonewall joint development of the F414 EPE for AMCA could be concern over Indian plans to fit the AMCA engine with thrust vectoring nozzles developed with assistance from Russia's Klimov. Russian engine technology lags behind the US state-of-the-art, and the US could be worried that the Russians will get a close look at the F414 EPE. However, Russia claims that its Item 30 engine being developed for the PAK/FA would match contemporary western aero engines. The first prototype of the Item-30 engine is due to be delivered later this year. Pinaka rockets were successfully tested with submunition warheads, including a thermobaric warhead, at Pokhran during field firing trials in Rajasthan on June 29, 2015. The submunition warheads tested are among the eight kinds of warheads for Pinaka. Thermobaric warheads are deadly against personnel and inflammable targets. Other warheads developed include cluster warheads armed with anti-personnel and anti-tank submunitions., and runway denial penetrating submunition warheads, aimed at neutralizing targets like runways and other complexes.